If you are trying to think of something special to do this holiday season, look no further! 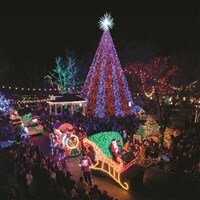 Branson, Missouri has become one of the entertainment hot spots of the entire country and this is no less true during the holidays. We're headed for a three-night stay that will make this one of your most favorite holidays ever. Sunday, our lodging will be in Columbus, Ohio and Monday we will stay in St. Louis, Missouri. Sadly, we must depart for home this morning. Our lodging tonight will be in Plainfield, Indiana. Our final evening will be in Wheeling, WV, but not before a stop at the National Museum of the US Air Force at Wright-Patterson Air Force Base. Following an included dinner, we will have a guided tour of the light display at Oglebay. We're sure our Branson Christmas tour will have you looking forward to Christmas! Arrival home will be by late afternoon.